The DSE7320 is an Auto Mains (Utility) Failure Control Module suitable for a wide variety of single generator applications powered by diesel engines. These control panels monitor your utility supply and, an extensive number of features on your generator. The control panel will display warnings, shutdown and show engine status information on the LCD screen, remotely through PC and via text alerts(with external modem). The cabins are made of high quality carbon steel sheet, aluminum and stainless steel. The enclosures are fully powder coated to prevent rust and deterioration from weather elements. The canopies come with folding or sliding doors for easy equipment inspection and maintenance. Air access vents and exhaust areas to assist with voiding enclosure of gas accumulation. Drainage system in place to avoid liquid accumulation. Cable opening on lower back area for convenient hook up. The machines are equipped with monitoring system, helping monitor the operation at real time. We provide DSE-7320 control module for your operation. The interior is lined with new type fire retardant and sound absorbing material. Rubber seals to absorb noise and heat associated with operation. Superior silencer and muffler pipe system dramatically reduce the noise during operation, allowing a functional work environment. Outer filling fuel port and drainage outlet. 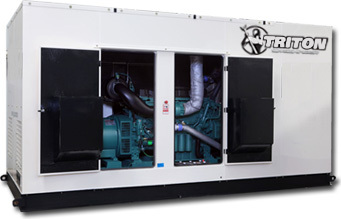 8 hour base fuel tank in soundproof generator sets prevent against leakage and fuel spray when cleaning the interior. Water fill is located on top of the canopy. Oil transfer pump on larger units. Clear labeling in visible positions, providing adequate information, safety presentation and convenience for operators.